Professor Paul Braun and graduate student Chunjie Zhang developed a continuous glucose-monitoring system that changes color when glucose levels rise. CHAMPAIGN, Ill. - University of Illinois engineers are bringing a touch of color to glucose monitoring. Before glucose is added, the hydrogel glucose meter is blue. The researchers developed a new continuous glucose monitoring material that changes color as glucose levels fluctuate, and the wavelength shift is so precise that doctors and patients may be able to use it for automatic insulin dosing - something not possible using current point measurements like test strips. "There are significant limitations to current continuous glucose monitoring technologies," said study leader Paul Braun, a professor of materials science and engineering at the U. of I. "The systems available today all have some combination of limited sensitivity, limited precision and frequent recalibration. Using today's systems, you can determine trends in glucose levels, but without frequent recalibration, you don't have the accuracy or reliability to use that to make insulin dosing decisions or to drive autonomous dosing." The Illinois sensor is made of hydrogel, a soft elastic jelly-like material, laced with boronic acid compounds. Boronic acid binds to glucose, causing the gel to swell and expand as the glucose concentration rises. 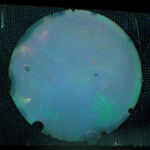 Embedded within the hydrogel is a photonic crystal made of tiny, carefully arranged beads. A photonic crystal is like a mirror that only reflects one wavelength of light while the rest of the spectrum passes through. 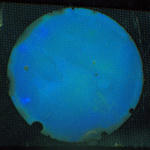 As the hydrogel expands, the reflected color shifts from blue to green to red. See a video of the color change. Researchers have previously explored the possibility of using boronic acid hydrogels for glucose detection, because they are not prone to interference from most factors in the bloodstream. However, they have been met with a specific challenge inherent to the chemistry: Boronic acid likes glucose so much that, if there isn't enough glucose to go around, two boronic acids will bind to one glucose. This causes the hydrogel to shrink before the glucose concentration gets high enough for it to expand again. "It's like people each using two arms to pull together two ropes of the polymer network, so the hydrogel shrinks," said Chunjie Zhang, a graduate student and first author of the paper. "When more glucose comes in, each boronic acid can have its own glucose. Now, each person only grabs one rope, so the hydrogel expands." The Illinois researchers devised a solution to this problem by introducing a third chemical, called a "volume resetting agent," to bind up the boronic acid before the glucose is added, pre-shrinking the gel and giving a baseline for measurements. 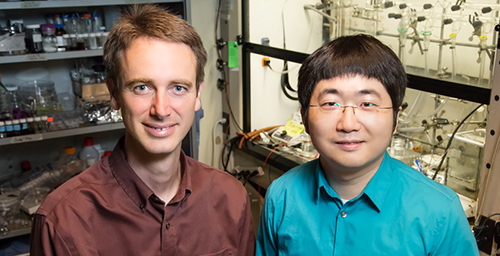 This development enabled the Illinois researchers to capitalize on the advantages of a boronic acid system without the limitation of shrinking at lower concentrations. "When we introduce the volume resetting agent, it grabs all the ropes and makes the hydrogel shrink," said Zhang. "Then when glucose comes in, it releases the volume resetting agent from the ropes and expands the hydrogel." 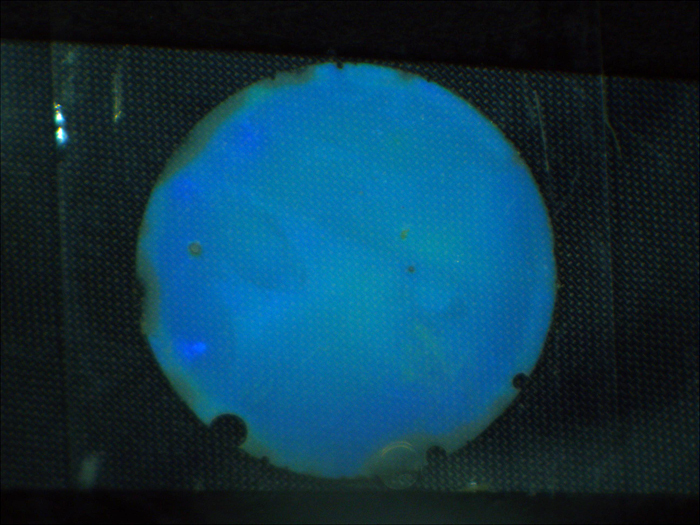 The color-changing material is simple and low-cost to manufacture, and according to Braun, a square inch of hydrogel could be enough for up to 25 patients. The researchers envision the hydrogel as part of a subcutaneous system or a sophisticated device that taps into the bloodstream - an insulin pump, for example. However, the application they are most excited about is in short-term continuous monitoring of patients hospitalized or in intensive care units, when patients are most critically in need of continuous monitoring - diabetic or not. "The sensor would be put on the end of a fiber optic cable, for example, and threaded into the bloodstream along with IVs or other monitors," said Braun. "You could just slide it into an open port. Then you can monitor the patient for several days or longer." The Defense Threat Reduction Agency and the U. of I. supported this work. Braun also is affiliated with the Beckman Institute for Advanced Science and Technology, the Frederick Seitz Materials Research Laboratory, and the departments of chemistry and of mechanical science and engineering at the U. of I. Gerry Cano of the Vytrace Corporation in Pittsburgh is a co-author of the paper. The paper, “Linear and fast hydrogel glucose sensor materials enabled by volume resetting agents,” is available online.